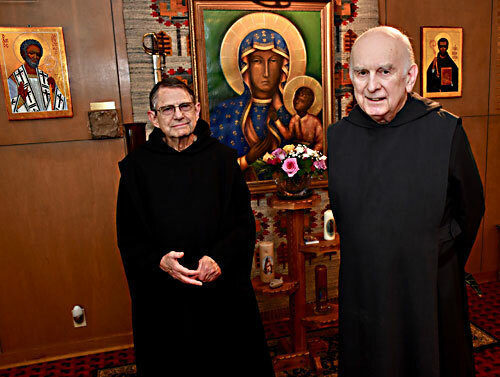 OSHKOSH — For half a century, the monks of the Community of Our Lady Monastery have been leading a prayer-centered life on a tranquil location on the shore of Lake Butte des Morts. They will celebrate the 50th anniversary of their monastery Aug. 25 with a noon Mass led by Bishop David Ricken and special guests. Fifty years ago, Fr. Barwig, Fr. Augustine Serafini and Fr. Eugene Kalinski had been together at St. Procopius Abbey in Lisle, Ill., professed as Benedictine monks and were involved in teaching. After the Second Vatican Council, they sought to establish a more prayer-centered community. They were invited into the Diocese of Green Bay by then-Bishop Aloysius J. Wycislo. They spent their first year in Green Bay. Then, at the suggestion of the bishop, they established their permanent home on the lakehouse property in Oshkosh. The Community of Our Lady Monastery is dedicated to Our Lady of Czestochowa, a sacred icon in Poland. Br. Joseph Le Sanche was a fourth member of the community for several years, and Fr. Kalinski died in 2012. Fr. Barwig, 87, and Fr. Serafini, 82, are the remaining members of the community. “We wanted a more contemplative way of life, in prayer,” Fr. Serafini said. “The priesthood was foremost in my thoughts and prayers since childhood.” Through his studies, he became interested in the history of the church, St. Benedict, the founder of western monasteries, and the contemplative life. Although the monks continue to follow the Rule of St. Benedict and are dedicated primarily to prayer, “we’re not isolated,” Fr. Barwig said. Both Fr. Barwig and Fr. Serafini said that life and the service of God are meant to be shared. The community is self-sustaining and has always been involved in a variety of services aimed at bringing to people peace and understanding of the faith. “Our purpose is to present Christ to the world, beginning in our hearts and the way we live,” Fr. Barwig said. They have assisted local parishes, offered one-on-one spiritual direction with individuals both in person and through correspondence, guided people in prayer, held retreats and study groups, and participated in mission work. Fr. Barwig does translations from Latin, Italian, Polish, Hebrew and Greek. He has published five books and numerous articles, and Fr. Serafini has published two books. Fr. Serafini said having a mind for the whole church helps themselves and their visitors to reaffirm their spiritual life and to renew their lives. “People have come here to get some equilibrium,” he said, and they have tried to guide seeking Christians through trials in their lives. Fr. Barwig added, “The monastic life is fed by the work of God, the sacred literature, prayer and celebration of the holy Eucharist. We make these available to others. “The monastery is a microcosm of the church. Your best contribution is prayer for people and prayer for the church. We are here to keep alive the faith. It’s a useful blessed thing to see how we can support others in their striving to serve God,” he said. The monks are here to be of service in a spiritual way, added Fr. Barwig, and the anniversary celebration is an occasion for them to renew and readdress their purpose in life.